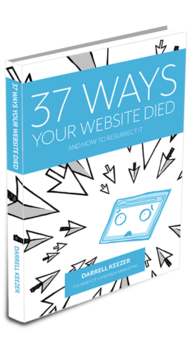 Darrell Keezer's new book 37 Ways Your Website Died highlights the reasons why your website is dead and what you can do about it. This helpful guide book will point out what you are doing wrong and teaches you how to engage, attract and convert leads. Candybox Marketing Founder Darrell Keezer is a sought after public speaker and given keynotes on marketing, social media and websites at Marketing and Entrepreneurship events across the country. Read the introduction and first 2 chapters for free! BRING LIFE BACK TO YOUR WEBSITE.